Two maps illustrate the demographic distinctiveness of the white South. 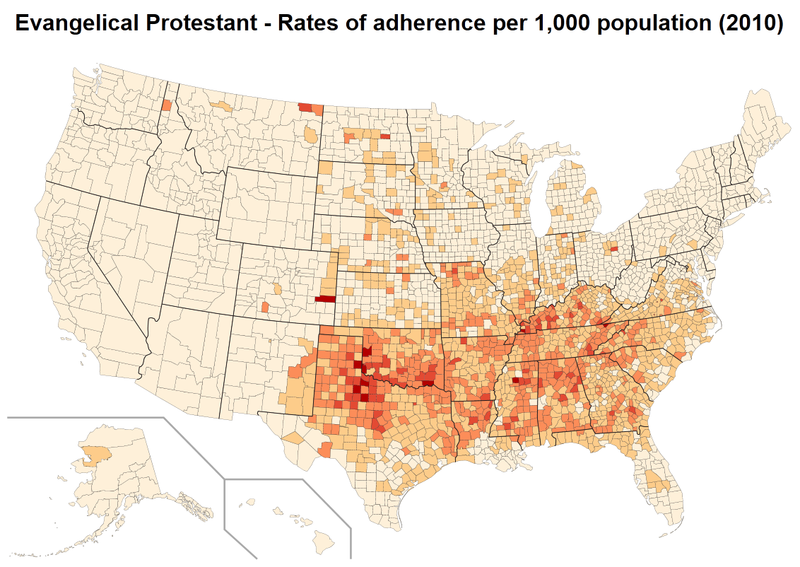 The first shows the close correlation of evangelical Protestantism with the states of the former Confederacy. The second map is even more revealing. It shows the concentration of individuals who identified themselves to census takers as non-hyphenated “Americans." The demographic demise of the white South is going to be traumatic for the nation as a whole. A century ago, when European immigration made old-stock Yankee Protestants a minority in much of the Northeast and Midwest, one response was hysterical Anglo-American nativism. In a 1921 essay in Good Housekeeping titled “Whose Country Is This?,” then Vice President Calvin Coolidge, an old-stock Yankee from Vermont, explained: "Biological laws tell us that certain divergent people will not mix or blend. The Nordics propagate themselves successfully. With other races, the outcome shows deterioration on both sides." Patrician Yankees promoted immigration restriction to prevent “inferior” European races from further contaminating America. Some eminent Americans of New England descent, including Henry James, T.S. Eliot and Ezra Pound, all of them nasty anti-Semites, took the extreme step of expatriating themselves. James and Eliot became British subjects and Pound made anti-American broadcasts for Mussolini during World War II.